AT&T today said beginning Dec. 10 all Alltel stores and services across Georgia will be rebranded under the AT&T name. Further, AT&T says more than 100,000 former Alltel wireless customers in Georgia will begin using new devices that work on AT&T's network early next year. AT&T completed its acquisition of Alltel in late 2013. Alltel ran a CDMA network, but AT&T has been transitioning Alltel customers to its own GSM-based network. In order to gain FCC approval of the Alltel acquisition last year, AT&T agreed to launch LTE to Alltel customers within 15 months of completing the sale. It also agreed to run Alltel's CDMA network through June 15, 2015. AT&T didn't say how many Georgia customers are still using the old CDMA network. AT&T is encouraging any remaining Alltel customers to visit the new AT&T stores and switch to AT&T's handsets and services. The Federal Communications Commission today approved AT&T's proposed acquisition of spectrum and assets from Atlantic Tele-Network's Alltel properties. The deal, first proposed earlier this year, gives AT&T wireless spectrum licenses in the 700, 850, and 1900MHz bands, network assets, retail stores, and 620,000 subscribers in markets sprinkled throughout the mid-west. However, the FCC has placed conditions on the deal. "Based on our analysis, we find that the proposed transaction will likely cause some competitive and other public interest harms in several local markets. We find, however, that the proposed transaction is likely to result in public interest benefits that, when combined with voluntary commitments from AT&T, will mitigate our competitive concerns. AT&T's voluntary commitments in the areas of network deployment, roaming, and customer transition allow us to conclude that the proposed transaction overall is in the public interest." In order to win the FCC's approval, AT&T had to commit to launching HSPA+ and LTE service across the new spectrum assets within 15 months and 18 months, respectively, of the transaction closing date. AT&T also committed to offering CDMA voice and data roaming services over the Alltel 3G EV-DO network until at least June 15, 2015. Last, AT&T committed to offering Alltel's customers a handset comparable to their existing handset at no cost and without requiring a contract extension. AT&T will have to file quarterly progress reports covering these commitments for the next three years. The Federal Communications Commission today stopped the unofficial 180-day shot clock on its review of AT&T's proposed purchased of Atlantic Tele-Network's Alltel assets. The deal, first proposed earlier this year, would give AT&T wireless spectrum licenses in the 700, 850, and 1900MHz bands, network assets, retail stores, and 585,000 subscribers. According to the FCC, AT&T has not adequately explained how it will transition the Alltel customers from Alltel's service to its own. Without that information, the FCC cannot complete its review. The FCC says the review was on Day 175 out of 180. Verizon Wireless was forced to divest some of Alltel's assets when it purchased the company in 2008. Atlantic Tele-Network picked up some of the assets and continued to run them under the Alltel name. AT&T agreed to pay Atlantic Tele-Network $780 million for the spectrum licenses, assets, and customers. AT&T's Jim Ciccone, EVP of External and Legislative Affairs, said in a statement posted to ATYT's web site, "AT&T is ready, willing and able to make significant network investments in these rural territories to bring HSPA+ and LTE services to Allied’s customers, an investment that will not occur but for this transaction. AT&T has actively worked to address FCC concerns and will continue to work with the Commission until all issues are resolved." Alltel Wireless recently announced the addition of the Alcatel One Touch Ultra 960C to is lineup. 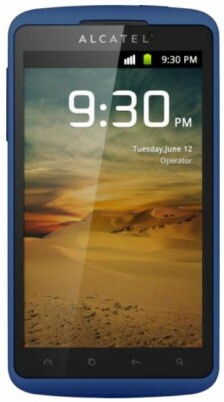 The One Touch Ultra is a variant of the Alcatel Authority, which is sold by Cricket Wireless. The One Touch Ultra has a large, 4.3-inch WVGA display, 5-megapixel camera with 720p video capture, and runs Android 2.3 Gingerbread. It is powered by a single core 1.4GHz processor, includes the Swype virtual keyboard, and Bluetooth 3.0. The One Touch Ultra is available for $19.99 with a new two-year agreement, or $199.99 with one of Alltel's No Contract plans. U.S. Cellular and Alltel today announced a new alliance to expand Alltel's U Prepaid brand to U.S. Cellular's footprint. The no-contract prepaid service will be sold in Wal-Mart stores in each carrier's coverage area, including communities across 18 states. The initial phone lineup will include the Samsung Repp Android phone, plus the LG Attune, LG Saber, and Samsung Chrono. The service will use Alltel and U.S. Cellular's networks, but also offer nationwide free roaming service. Nuance Communications today announced that it has agreed to purchase Transcend, a company that offers medical transcription and speech editing products, for $300 million in cash. Nuance said that the purchase will help it expands its customer base into the medical field. Nuance has acquired a number of other voice transcription and predictive text companies in the last year, including the popular Swype Android keyboard. Nuance also recently announced that it is providing the technology behind Alltel's voice-to-text transcription service for customer texts and emails. Verizon Wireless has revealed that it will not activate legacy Alltel handsets on its network any longer. Moving forward, Verizon Wireless will only activate Alltel devices on its network that are currently active on the Alltel network. Old Alltel handsets that have never been activated will no longer be supported. "To give customers the best experience on our network, we are encouraging them to move to current devices. Customers who are told they cannot activate an older Alltel device are able to take advantage of any current promotions, including free devices as offered on our web site," said Verizon Wireless. Verizon closed its acquisition of Alltel in January 2009.